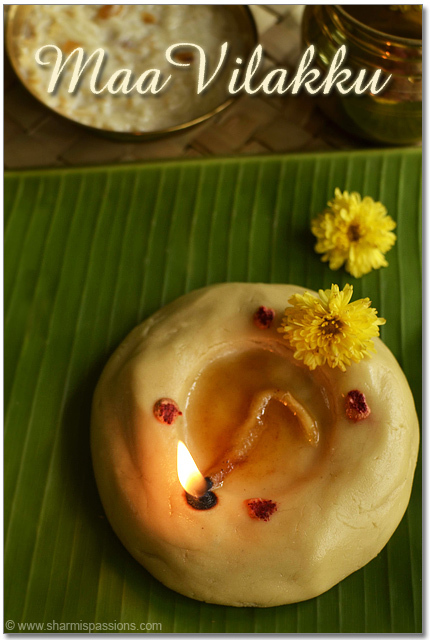 Maa Vilakku (Rice Flour Lamp) is made during special occasions such as aadi velli,purattasi sani, thai month, karthigai deepam etc.Maa Vilakku is a special lamp made with freshly ground rice flour and jaggery kneaded together as a dough placed on a banana leaf with a dent in the middle where we pour ghee,place the wick(thiri) and lit the lamp…we also apply kumkum on all 4 sides of maavilakku and place flowers on/near when we offer to god as shown in the pics. Last time when I visted my native my aunt made maavilakku and took it along when we visited the amman temple….at that instant I decided to post the recipe here as I love maavilakku but totally forgot about it….Yesterday when I was conversing with Lavi asking about ideas to post for karthigai deepam she casually said maavilakku would be apt…And today during a casual talk with my neighbour she said they make maavilakku for karthigai deepam so decided that I should post it for the occassion. 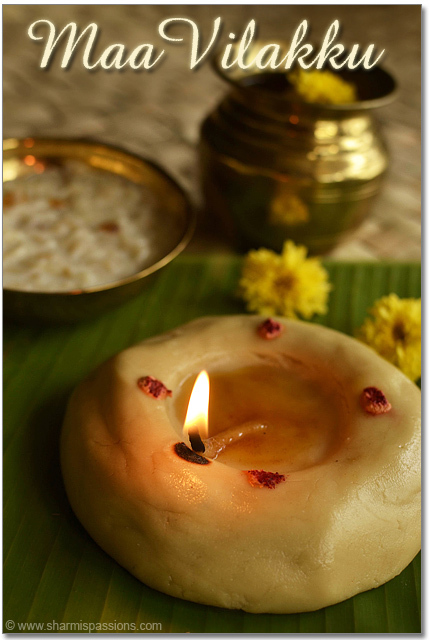 So I quickly called up my cousin for the recipe , made maavilakku and clicked it today…I loved clicking diyas and maavilakku is no exception…I enjoyed clicking it too. I remember those days when we as kids used to fight for the lamp-lit-part(the black part where the lamp is lit) as it tastes so good…. 🙂 It gives me such immense pleasure and satisfaction when I try out traditional recipes and post it here….yes small deeds big contentment!! Now lets learn how to make traditional maavilakku recipe…shall we?! First rinse the raw rice twice, and soak it in water for 1 hour. Drain water completely and then spread the raw rice in a soft towel and allow it to dry say for 30-45mins.It will be slightly moist only.Then transfer this to a mixer. Grind it to a fine powder in a mixie in batches.Then sieve it. If you find small balls break and sieve it. Sieve until you get rava like mixture.Add it to the next flour batch and grind it again. Now take sieved rice flour,jaggery and cardamom in a mixer and pulse it once or twice not more than that….this is to ensure even mixing.Transfer to mixng bowl and leave it aside for 10mins for the jaggery to slightly leave water. When you press with your hands it will hold its shape….Start kneading…the moisture in your hands and the melted jaggery will give a soft smooth dough. Add gingelly oil at this stage and mix well. 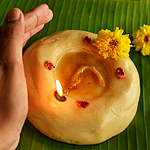 Roll it like a ball and transfer it to banana leaf.Using a tumbler slightly press to get a dent in the middle.Add ghee in the dent and lit the lamp as shown and offer to god as neiveidhyam. Soft mavillaku ready to be served! 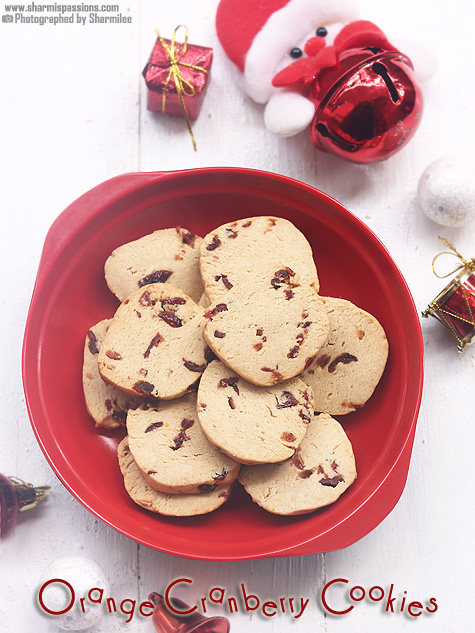 Serve it along with coconut pieces, tastes yum!! Though the traditional way of making maavilakku is using freshly pound rice flour…you can use readymade riceflour too but sure will have compromise in taste.If you are using readymade rice flour then for 1 cup of rice flour use 1/2 cup powdered jaggery. Just pulse it once or twice not more than that else jaggery will let out water making the dough sticky and watery too. I didnt add water at all, but if you feel its too dry then drizzle few drops while kneading. Keep on kneading till it comes together and forms a smooth dough. The amount of jaggery depends on the jaggery variety too.I used urundai vellam, it may differ slightly if you use achu vellam / paagu vellam. You can even replace gingelly oil with ghee itself. This keeps well in for 3-4 days in room temperature itself. 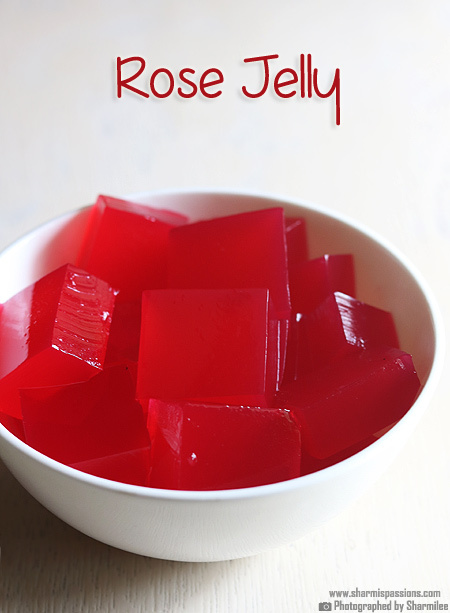 You can even keep it refrigerated but it becomes slightly hard, so bring it to room temperature and then serve it. As its just raw rice flour……consuming more of it the same day will cause stomach ache. Will surely try this for Tulasi pooja tomorrow . Thanx. Hi, Sharmi I am getting addicted to ur blog. But I enjoy this addiction…. 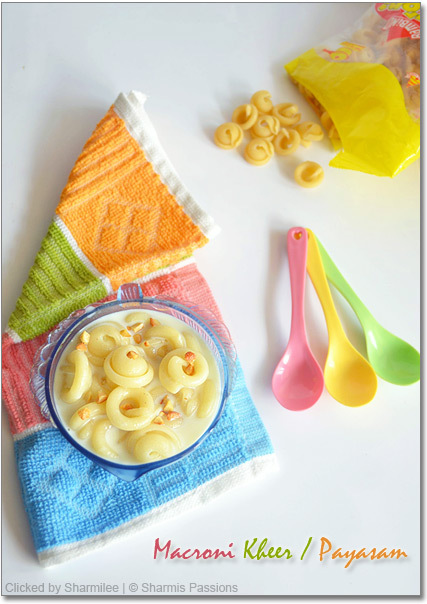 :) Maavillaku recipe looks yummy. I love ur photo…. Wow..Sharmi, only through your posts i came to know all our Festival/Special occasions..great job and hats off to your Commitment. Maa Vilakku looks divine..beautifully presented! Wow!! very beautiful and unique dish..
Hi, i love this since my childhood and was searching for the receipe. Thanks a ton. So well prepared. I have never heard or seen edible diyas till today. Love the maa vilakku and the pics. Happy Karthigai to you and your family. 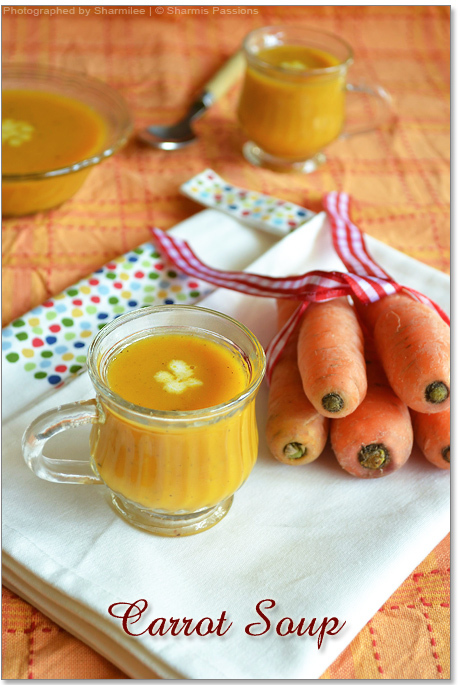 Love the recipe and beautiful pictures.. 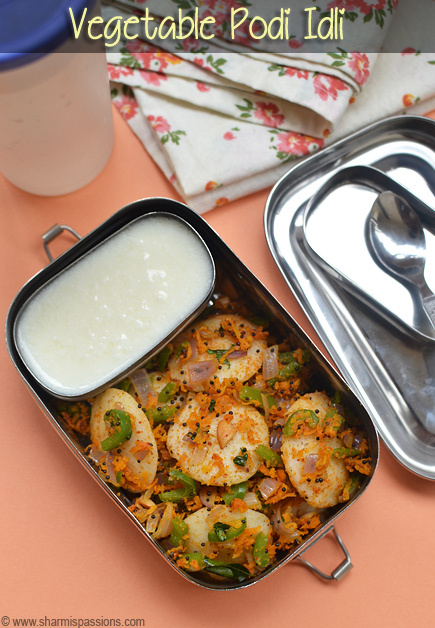 Yes there is a great sense of contentment when doing traditional recipe…. beautiful…. 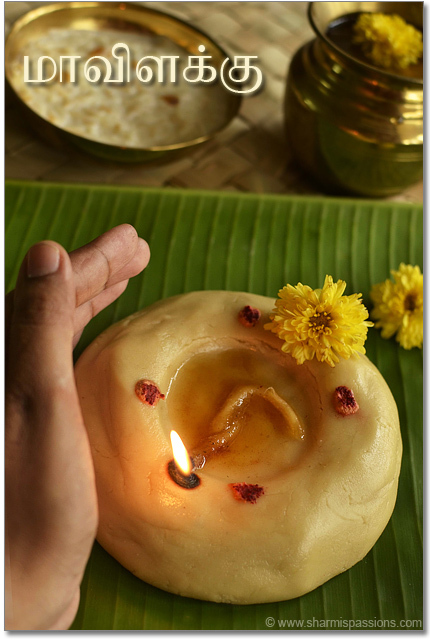 have seen people using this diya in temples and remember having them as prasad….Can't think of doing them, but brought back a lot of memories! 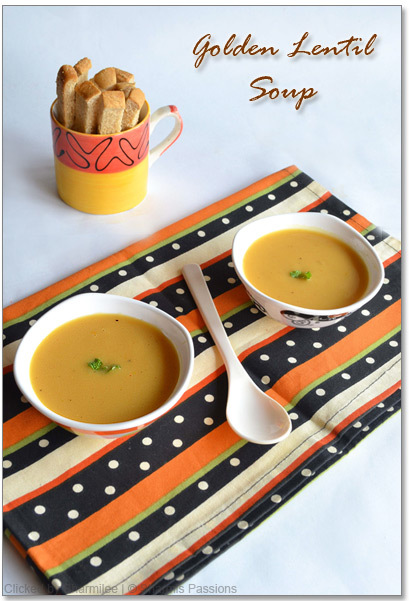 Thanks for the recipe…very nice..
lovely clicks! esp with your hands! i like this maa vilakku very much sharmi. but i was afraid to try. will try it for next deepam! Another version is using grated coconut and sugar instead of jaggery and lil more ghee with the same method.Kids love it like anything and tastes like a milk sweet. Shari hats off! You are doing your part to keep the tradition going on. I really appreciate that . In the farms when we celebrate pongal this maavilakku plays a main role but nowadays even the farming community are not bothered to do it ! Happy with ready made sweets. It's a pity. We'll done!!! So proud of your work! 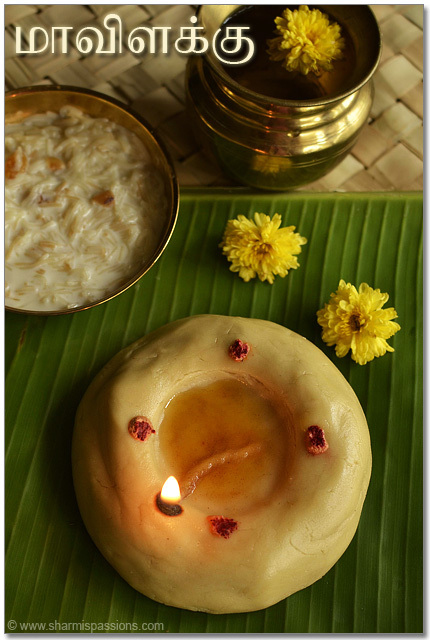 Please let me know the method of maa vilakku with sugar instead of jaggery…. This is good for festive time. Thanks for sharing.